High temperature casters manufactured by National Caster Corporation are designed for use in industrial and commercial high temp environments. Our casters are engineered and built to the demands of the industry. Casters and wheels for new and replacement applicatioins. Call to speak with a representative for business-to-business selections and ordering. High temperature glass-filled nylon wheels are well-suited for a moist heat location. At 30 minutes continuous use, 475° F is acceptable. For intermittant usage, 525° F is the recommended maximium temperature. Using glass-filled nylon in dry heat, and for higher degrees than noted will decrease the lifespan of the wheel. 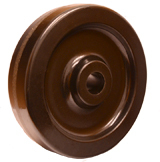 A high temperature Phenolic resin wheel performs well in dry locations with an acceptable range of 30 minutes at 475° F. A Phenolic wheel designed for high heat also has an intermittant usage temperature of 525° F.
Brass, roller and plain or sleeve bearings may be selected..
Caster connection types in grip ring stem, grip neck stem, top plate, and threaded stem available.